How do I explain Deanna Durbin? 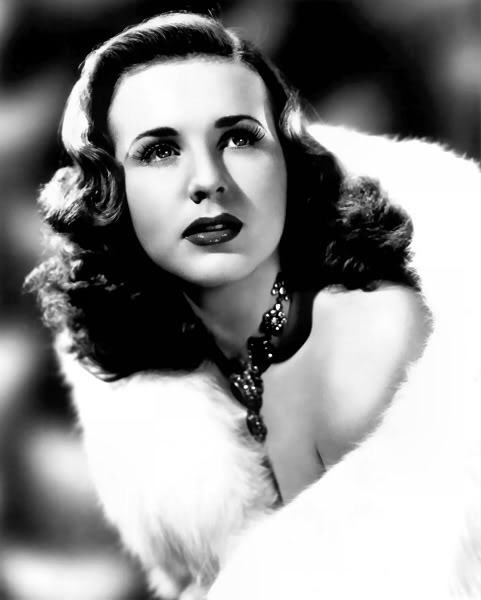 Deanna Durbin was one the most special, talented, beautiful, joyful actresses of the 1930s and 1940s. That is her legacy. She intentionally ended her short career at its height, because she didn't need the career. She was a wonderful actress and singer and person. She is the definition of multifaceted; there are so many things that could be written about her. Yet, I have no words. I am not a writer of serious reality. How do I even attempt to explain her importance in my life, without sounding crazy or maudlin or something worse? I feel terrible grief for someone I did not know. I never met her. I never had any contact with her (except for one lovely instance). But, I can think of no other person -- aside from family and friends -- who has been more present in my life. I suppose I could write about her independence, her persona, her uniqueness, as being inspiring to me. And, it's technically true. But, it also seems trite. And easily definable. Of course, even writing that it is indefinable -- seems trite. I grieve a loss. 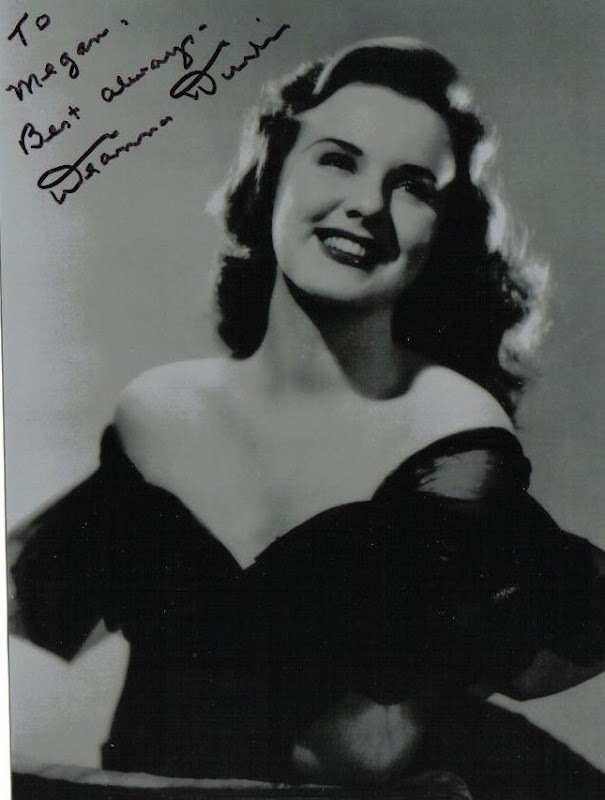 Deanna Durbin has been at the forefront and the background throughout my life. The first time I was ever allowed to stay up until midnight on New Years Eve (age nine), I spent it watching Lady on a Train on VHS and drinking tea with a friend I still know well. We haven't watched it together since then (nearly ten years), but both of us instantly understand if either of us claim, "It's a pipe!" My library used to have an entire half shelf dedicated to just Deanna Durbin VHS. I ran to them every time. I watched each one over and over (I had seen all but one of her films before age ten). I remember doing chores with the movies playing in the background. I chose the specific moments to vacuum, so I didn't have to pause the movie. I remember being ten and my older sister was house-sitting and she let me stay with her one night. It was so exciting... and we definitely watched a Deanna Durbin movie. I remember meeting a new friend in Sunday School when I was eight. She was new and seemed super-cool and I somehow got up the nerve to introduce myself and conversation quickly turned to Deanna, as you do (or as eight-year-old Millie does). AND SHE KNEW AND LOVED DEANNA TOO. We were fast friends and I used to go to her house to watch Deanna movies (her mother had bought like five off of Ebay). I still keep in touch with her. The first time my family got internet in the house, I was probably eleven. My mum told me that I could print off one page of anything I wanted. 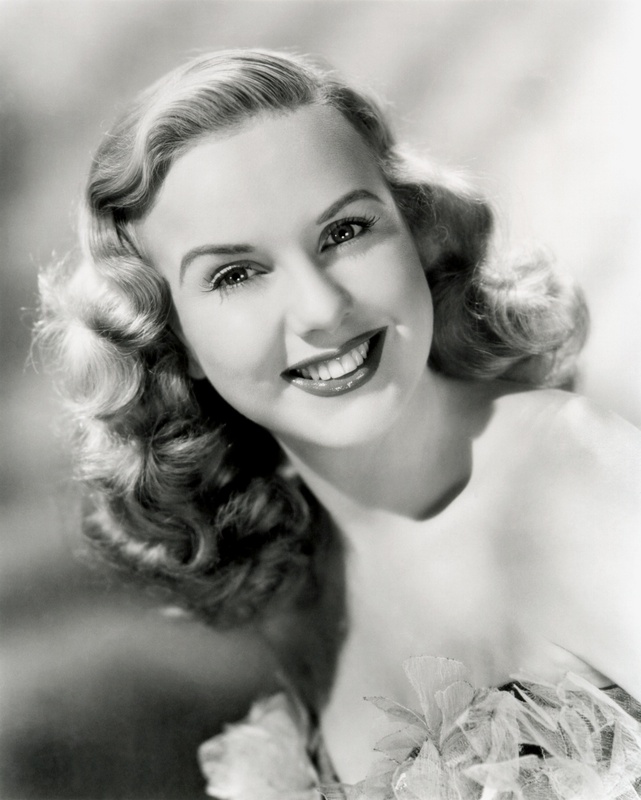 Of course, I printed off a photo of Deanna Durbin. It's still tacked up in my room. When I was fourteen, I sent a barely legible and terribly written note of complete adoration off to France. I think I listed my favorite movies and songs in order or something equally frightening. Being the dork I am, I didn't send a photo to be signed or an SASE or anything, because I didn't think it would ever even reach her. She was an extremely private person and she had completely left Hollywood forty-five years before I was even born. A couple of weeks later, this arrived in the mail. 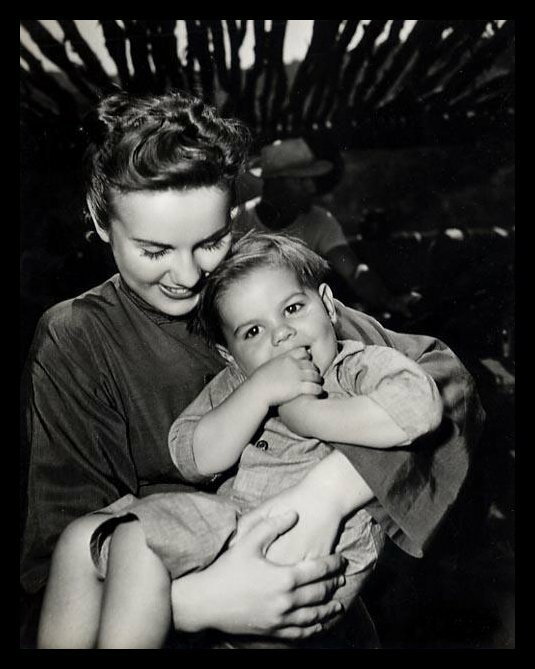 I don't think anything else could more describe who Deanna Durbin was: genuine, sweet, caring, real, kind. I never doubted it, but she proved her persona to me in one envelope. I'm not sure when I first watched one of her films. It was probably Three Smart Girls -- and I was probably like eight months old. I do, however, vividly remember seeing a Can't Help Singing VHS from the library sitting on top of the TV when I was six. I watched it and was utterly transfixed and gone and never coming back. She was gorgeous and plucky and lovely and funny and adorable and she just sang perfect classical opera at random moments. And six-year-old me could not imagine anything better. A lot of times, you'll hear girls talking about what they "played at" when they were little. Some talk about pretending to be a princess. And others say that they were warriors, not some wimpy princess. I was above all of that. I was stinkin' Deanna Durbin. And I sang opera songs and everyone loved me, because it was physically impossible for them to dislike me. In my daydreams, as in many of her films, not all people started out liking me. But, then I wowed them with my personality and did nothing else and they adored me. I have an absolute suspicion that my life spent being insane and more-than-slightly annoying, but absolutely myself (despite trying to hide it much of the time), is due in large part to Deanna. It works a little better when you are perfection-personified, but still -- it's a good value. Seven-year-old me didn't watch Deanna movies for the same reasons as their original Depression audiences. For me, it wasn't about providing relief from the daily life. She was actually a part of my daily life. It probably sounds delusional and crazy and I know. But, I will miss her. And, I'm not even gonna say something about her living on through her work. It's definitely true and my two-year-old niece sits transfixed at the sight of her (she did, however, tell my sister to turn off It Started With Eve, because Charles Laughton is "scary"). It's true, but right now I'm grieving a loss. I didn't know her; I wasn't related to her, but I grieve a loss the same. I couldn't possibly disentangle her image or her voice from the years of my life. I have a Deanna CD (given to me when I was probably eleven by the afore-mentioned Sunday School friend) that's been playing while I write this post. And I had to stop when "Waltzing in the Clouds" played, because there are so many times of joy and pain and fear and awesomeness -- of life -- that I remember listening to that song during. These recounting of memories could go for another 158,000 words, but I've already made this post more about me than Deanna. But, maybe that's the only way to explain. I find it impossible to describe Deanna Durbin's peculiar and particular impact on me, so I've tried to explain my reaction to this peculiar and particular impact. It's messy and maudlin and makes little sense, but I had to write something. I'm sure I'll be posting more in the next few days. I need to properly acknowledge and pay tribute to her extraordinary-ness. But, for now, I can only say good-bye to a truly lovely human.